Published in 1983. The concept of education has generally been assumed to relate to childhood and it is only with more recent developments in the field of adult learning that it has been recognised that education can take place at any stage in life. One of the main intentions of this book is to examine the concept of education from the perspective of the education of people in a wide variety of professions. It is suggested that education be defined as any planned series of incidents, having a humanistic basis directed towards the participants’ learning and understanding. The aims, curricula and methods of appraisal of professional education in the light of this definition are then considered. 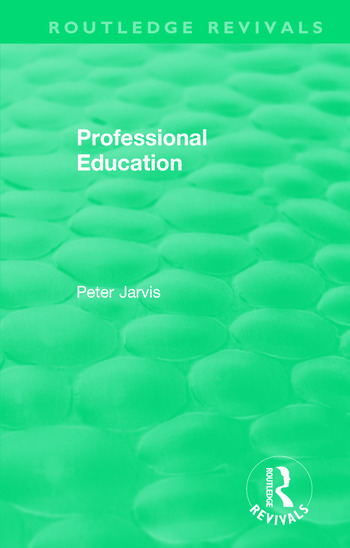 Although dealing with professional forms of learning for the most part, this book should be of interest to all educators, trainers and administrators responsible for the implementation of educational policies and programmes in higher, further and continuing education. 1. The Changing Concept of Education: Theory and Practice. 2. The Professions. 3. The Aims of Professional Education. 4. Criteria for the Selection of Curriculum Content in Professional Education. 5. Knowledge, Skills and Attitudes. 6. Educational Processes. 7. Appraisal in Professional Education. 8. Teachers and Teaching in the Education of Professionals. 9. Confronting some Ethical Issues.